Football fans seldom think about playing the sport itself, T.J Moe is an exception. Ever since he saw his first game with his Dad, the former NFL wide receiver knew exactly what he wanted to do. “I was a big football fan and I think the Rams moved to St. Louis in 1995 and my dad had season tickets and we would watch the games and go to a game or two every year,” Moe said. Moe started his career at 7-years-old, played every position in pop warner, and would continue to play football into high school as well as basketball. However, his heart was always into football, where the highlight of his high school career was a record-shattering performance. When it came time to pick a college, he had offers from institutions throughout the country including Stanford and Wake Forest, but Moe said he had his heart set on the University of Missouri—his state school. 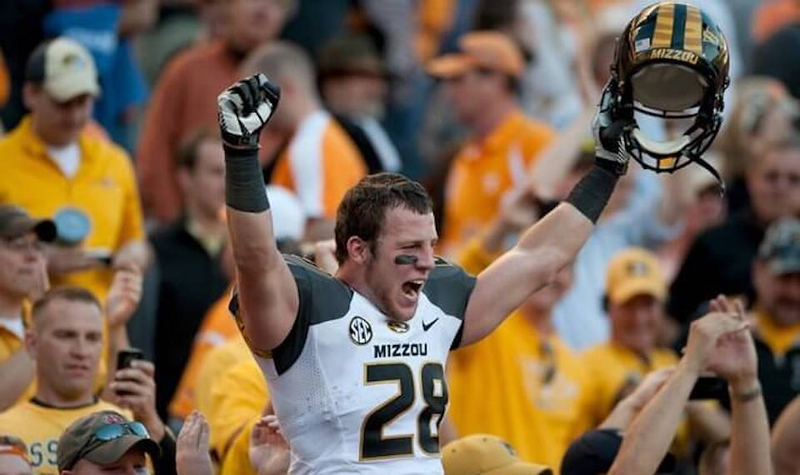 He joined the University of Missouri Tigers football team where he played slot receiver for his entire tenure leading up to his and the football team’s most memorable moment in 2010, when they beat the at the time ranked No.1 football team in the country Oklahoma. With college football over and done with, he put his sights on a career in the National Football League. Moe said while he was in school, Missouri ended up assisting him in getting ready to play professionally. Because of the training and assistance he was given in Missouri and in Tampa, Moe recorded the best three-cone drill time out of any wide receiver at the combine. Despite going undrafted, Moe caught the attention of multiple teams, including the New England Patriots and their head coach Bill Belichick. Moe signed a contract worth $30,000 in guaranteed money, which was the highest amount the Patriots paid any undrafted free agent that season. He seemed ready to make a case for a roster spot despite the depth the Patriots had at the position. He hit the ground running in New England, taking the field for offseason training activities and did not shy away from saying how complex the New England Patriots’ system was. In his short time with the team, Moe harked back to the experience he had to catch passes with quarterback Tom Brady and how good it was to catch passes as well as learn from him. This experience was short-lived, however, as Moe was placed on injured reserve on June 1 after tearing his Achilles and would never get to see the field. The Patriots released him on March 10, 2014, and Moe joined his childhood team the St. Louis Rams for training camp but got cut shortly after. Moe found his way back into the world of sports not as a player, but as a journalist and a talk show host covering his alma mater. On top of doing sports talk radio, Moe also has his own podcast with friend Eric Messersmith that he has been taking steps to grow more and more. Instead of training different muscle groups, Moe spends his days pumping his brain up with certain subjects for his podcast called “Take No Offense”. The show combines podcasting with a live internet show that airs three times a week from all of his personal social media accounts in which he has gathered thousands of followers. Fans catch the show on Monday’s, Wednesday’s, and Friday’s live at noon but Moe said there’s much more content for fans to enjoy as they try to make a transition to more of a podcast format. “On Thursday night’s we have a guest and we are now doing a lot of the college football stuff, as well as covering the St.Louis Cardinals trying to become more of a traditional podcast rather than just an internet show,” Moe said. While he doesn’t play anymore, Moe can’t help but be happy where he is as he is having a lot of fun with a career that while difficult, presented him with fantastic opportunities for building his life after football.